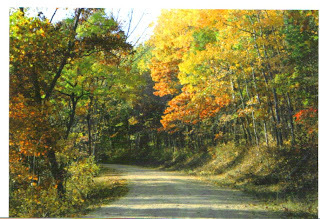 Well hopefully this is the last fall card I will have to make this year. I had to do one last fall card for a Guest Designer Challenge on the Caardvark's blog, and I also decided to use it for Patter Cross's Scripture Challenge #47 'Thankful'. As one season comes to end, I always get so 'tired' of making the same style of card. Now I need to start making my Christmas Card, and I'm sure in about two or three weeks, I'll be tired of those too! LOL! Anyhow, because its Thanksgiving week, Patter wanted us to focus on being Thankful. I am thankful for many things, first of all that Jesus died for me, that is the most precious thing to me. But I am also thankful for the wonderful family and friends I have, my beautiful home, my pets, the fact that my husband STILL has a job during this uneasy economy, and for very good health this past year. And I'm really happy that I don't have to have a 'real job' and therefore have a lot of time to express my creativity thru my crafts, garden, and home. This card was made using a very old, retired Stampin Up! set called 'Season of Thanks.' The Cardstock Colors are Stampin Up! 'Naturals Ivory', 'Close to Cocoa', 'Old Olive', 'More Mustard', and 'Really Rust'. I colored the image with copic markers. The Sentiment is mounted up on dimensionals. The 'More Mustard' panel was embossed with the Cuttlebug "Houndstooth" Embossing Folder. The leaf is from Stampin Up! 'With Gratitude' and is stamped in Versamark. I added ribbon and raffia for embellishment. I made this Sympathy card for someone that lost their sister on Thanksgiving Day. I used the sketch from last week's Sketch Challenge on Paper Craft Planet, and the colors are from this week's Color Challenge on Splitcoaststampers. The images are from Stampin Up! 'Brighter Tomorrow' (retired), Inkadinkado 'Garden Flower', and Basic Grey Two Scoops 'Flower Swash'. The cardstock colors are Stampin Up! 'Really Rust', 'Going Grey', and 'Very Vanilla'. I used a glitter designer paper for the background. The 'Going Grey' panel is embossed with the Cuttlebug. I added adhesive crystals and velvet ribbon for embellishment. The main image is mounted up on dimensionals. I made this card for the Featured Stamper Challenge on Splitcoaststampers. EBETHNEU's card can be seen here: http://www.splitcoaststampers.com/gallery/photo/844252 The challenge rules are to pick a card from the Featured Stamper's Gallery and change at least two things about it. I changed the designer papers, the image, the sentiment, and the embellishments. To give my card a vintage feel I distressed the designer papers and then sponged the edges with 'Antique Linen' distress ink. The image is a very old and retired Stampin Up! set called 'A Thing of Beauty'. The main image is mounted up on dimensionals. The sentiment is from Inkadinkado. I used my sewing machine to sew the designer paper onto the 'Close to Cocoa' cardstock. I didn't do a 'perfect' job with the sewing on purpose, so it would look more aged. Primas, ribbon, and adhesive pearls were added for embellishment. I made this card for a four year old girl who was diagnosed with cancer. The family wanted the little girl's birthday to be extra special this year, so they requested birthday cards on Splitcoaststampers. I used the sketch from this week's sketch challenge on SCS, and the colors from last week's color challenge from Treehouse Stamps on Paper Craft Planet. The cardstock colors are Stampin Up! "Very Vanilla", "Chocolate Chip", "Cameo Coral", and "Riding Hood Red". The "Cameo Coral" panel is embossed with the cuttlebug. The images are from "Mindy's Zoo", the sentiment is from Hero Arts "Cupcake Images". I cut out and mounted up up the small giraffe. A clip and ribbon were added as embellishment. The Scripture Challenge Word on Patter Cross's Blog 'Triple the Scraps' last week was 'Path'. I picked the verse 'Your Word is a Lamp to my feet, and a Light for my Path.' Psalm119:105 as the theme of my card. This has always been one of my favorite verses, I even had the Amy Grant song 'Thy Word' sung at my wedding. I love this verse because it is so true: if we read and obey God's word, we will always be on the right path and His Word will always guide us through life's daily struggles and decisions. I made the card using images from Art Impressions and Kolette Hall. I watercolored the images with Stampin Up! Markers. The cardstock colors are Stampin Up! 'So Saffron', 'Wild Wasabi', and 'Riding Hood Red'. The Wild Wasabi panel is embossed with the 'Textile' Cuttlebug Embossing Folder. The sentiment is computer generated and mounted up on dimensionals. $1.00 a roll ribbon from Michaels was added for embellishments. This weeks Scripture Challenge word on Patter's Blog is 'Thankful', very appropriate considering the holiday. If you'd like to focus, in a special way, on how Thankful you are to God, come and play along with us! Have a Happy Thanksgiving everyone. I won't post again till Friday! I made these Thank You cards to send to the women who attended my Christmas Card Making Class. I love this image. Its so sweet and so easy to color. The image is from Stampin Up! 'Pun Fun'. The cardstock colors are Stampin Up! 'Going Grey', 'Pretty in Pink', and 'Whisper White'. I used my Cuttlebug to emboss both the pink and grey panels. Brads and ribbon were added for embellishment. The image was colored with copic markers. If you'd like to view this stamp set in the Stampin Up! Catalog, simply click on the catalog picture in the sidebar. I thought the colors of last weeks Paper Craft Planet Color Challenge were perfect for my new squirrel images, so I decided to make another 'Nutty Birthday Card'. The colors were Stampin Up! "Kiwi Kiss", "Elegant Eggplant", "Chocolate Chip", "Creamy Caramel", and "Very Vanilla"
I used the new 'Branches' embossing folder from Cuttlebug on the 'Creamy Caramel' Cardstock. The leaves were punched with the Martha Stewart "leaf" punch. Brads were added for embellishment. The images were colored with Copic Markers. The inside of the card says 'Happy Birthday' and has more squirrel and nut images stamped inside. The images are from 'Clear Dollar Stamp' and the set is called 'Just Nutty'. I had a wonderful time in Minneapolis yesterday watching the musical 'Wicked'. I will share photos and my story on my 'Birthday' post on November 28th! Thanks to all who have sent me birthday cards so far. I'm overwhelmed with your thoughtfulness. I just found this morning that I won the Queen Kat Designs Sketch Challenge! I was so surprised! It was such wonderful news to start my day! Anyhow, thanks Queen Kat Designs and Sheetload of Cards!!! I am anxiously awaiting my baggie of goodies to arrive in the mail. And for you stampers out there that are a little hesitant to submit your creations for contests/challenges, don't be afraid to try! If I can win a few now and then, so can you! I received this sweet image from High Hopes stamps as a 'thank you' for sending a online stamper some images. I just think its the cutest image ever, and I love how 'open' it is so I can really play with my coloring. I used the colors from the Week One Color Challenge on Paper Craft Planet. They were Stampin Up! Riding Hood Red, Really Rust, Basic Grey, and Whisper White. I embossed the Basic Grey background with the Heart Embossing Folder from Cuttlebug, the sentiment is also embossed. The image was colored with Copic Markers and I added brads and ribbon for embellishment. The Scripture Challenge word on Patter Cross's Blog 'Triple the Scraps' was cross. Well, how could I do a card based on this word without using an image of a cross? The cross means so many different things to so many different people. Just seeing its image causes a flood of emotions. Some people tear up, being reminded of the price that was paid for their redemption, other people are inspired and have renewed hope when they see its image or when they gently touch it as it drapes across their neck. Yet other people look at its image and are filled with hate and anger because they cannot accept the truth that lies behind the image. My own feelings differ when I look at a cross, depending on my mood that day or what I am going thru at the time. Most of the time, when I see a cross, I am filled with hope, and the thought the trials of this life will soon be over and I will one day live in Paradise where there will be no more tears. But somedays I look at the cross and feel ashamed for all I have done or not done for the One who suffered for me. But no matter what I am going through, or whether or not one is a Believer or not, no one can look upon this image and not feel SOMETHING. I made my card using the colors for the Treehouse Stamps Color Challenge on Paper Craft Planet. The colors are Stampin Up! 'Certainly Celery', 'Old Olive', 'Very Vanilla', and 'White'. The Certainly Celery background is embossed with the 'Rough Diamonds' Cuttlebug Embossing Folder. The main image is mounted up. It is from the retired Stampin Up! Set 'Symbols of Salvation'. The Very Vanilla Panel was cut using the "Label Two" Nestabilities Die. Ribbon and adhesive pearls were used for embellishment. I left off the sentiment because I want to have options for using this card, I will add a sentiment inside the card as the need arises. I think it could be used as a Sympathy Card, a baptism card, or a Hopeful card for a believer who is going thru a crisis. This week's Scripture Challenge Word is 'Path'. Come and grow in your faith, and play along with us. O.k., I know I've shown you my Post-It-Note Holders before, but I made three new ones and I thought they were so cute I just HAD to show you! Just in case you've never seen my Post-It-Note Holders before, I've included an OLD picture of the INSIDE of the first 4 Post-It-Note Holders, so you could get an idea of whats inside these little cuties. You can also look at the previous post to see the first Four Post-It-Note Holders I posted. This darling puppy image is from Penny Black's 'Critter Party' set. They have the cutest images in the set. The paper is from "The Pet Stack" that I bought at Michaels. The ribbon and hardware is from Stampin Up!. Cardstock colors are Old Olive, Basic Black, and Ruby Red. The Kitty image is also from the same Penny Black set. The designer paper was also purchased at Michaels. I added ribbon, primas, and dew drops for embellishment and put stickles on the butterflies. The cute skunk is from the Stampin Up! set 'Pun Fun'. I used the 'Swiss Dots' Embossing Folder on the 'Pink Pirouette' background, and added ribbon, a prima flower, and a brad for embellishment. If you'd like to see what else is in this fun set, just click on the picture of the Stampin Up! catalog in my sidebar. I made this card for a contest for Queen Kat Designs. They are celebrating their 2nd birthday and are celebrating by having a big sale AND a card sketch challenge where the winner will receive a nice prize package of their products. My card is made with Stamping Up! Cardstock and images. The colors are 'Pink Pirouette', 'Basic Black' and 'Pink Passion'. The main image is from the adorable set "Pun Fun". Its one of my favorite sets because the 'puns' are so cute and the images make quick and easy cards. I embossed the pink panel with the 'Swiss Dots' embossing folder from Cuttlebug. I added ribbon, brads, primas, and adhesive crystals for embellishment. The sentiment is from "Flight of the Butterfly". 1. The winner may put the logo on their blog. 2. Put a link to the person who sent you the award. 4. Put links to their blogs. Once a week I take a class at my local scrapbooking store. Yesterdays class taught us how to make jewelry. Yes, you heard me right, JEWELRY! This pin was made out of 'Outlines' stamps and Swarovski Crystals. Now first of all, these are NOT my designs, they are Judy's designs from Happy Stampers in Eau Claire, WI. I just really wanted to show you what we made in class last night because I thought you'd be interested, I know I've never seen anything like this before! I plan on making my own jewelry in the near future, and will show you MY designs then. The pin looks so difficult to make, but it was really quite simple. You just glue 3 sheets of black cardstock together using Elmers or Aileen's Tacky Glue. Let dry. Stamp your image and emboss with either silver or gold embossing powder. Apply Crystal Effects or Liquid Lacquer to the image. Let dry. Cut out image. Now, using the crystal effects like glue, apply your Crystals. Apply your 'pin', earring, or necklace back using more crystal effects, let dry, and wa-la, you have a beautiful piece of costume jewelry! Now the card was also made using Outlines Stamps. The main snowflake image was stamped on acetate and embossed with white embossing powder. Another identical snowflake image was stamped on dark blue cardstock. Stickles was applied to the back of the acetate. Two 'frames' were then stamped and cut out. The frames were glued to the acetate image and then everything was mounted up over the dark blue snowflake image on the card. It gives a really neat 'hologram' look. The bottom image was also assembled the same way, but used a different Outlines stamp. I had so much fun last night learning something new! If you live in the Eau Claire area, stop at Happy Stampers sometime and sign up for a class. We'd love to have you join us! I made these cute little 3 x 5 notebooks to sell at my Stampin Up! booth at a Small Business Women's Expo, and also to show people what else can be made with stamps other than cards. They were a huge hit, especially with pre-teen girls. I only charged $3.00 a piece because they were all made with scraps and only took minutes to make. Inside each notebook are just 3 x 5 notecards. I used 1/2 of the individual package that the notecards came in, and I bought them in a package of 3 at Walmart to save even more money. I used chipboard for the front and back covers and bound everything together with my Bind-It-All. These notebooks use Stampin Up!s retired set 'Delight in Life' and 'Girlfriends'. Each notebook is covered with designer paper that has glitter or something shiny on it. I then added ribbon, flowers, gems, or hardware for embellishment. These notebooks use Penny Blacks 'Critter Party' and the retired Stampin Up! set 'Totally Cool' and 'Girlfriend Accessories'. The puppy images are both from Penny Black's 'Critter Party'. The butterfly images are from Stampin Up!s current set 'Flight of the Butterfly'. To view this set, just click on the catalog image in the side bar. The owl image is from Inkadinkado's 'Birds Galore'. So if your looking for some stocking stuffers, or some quick and easy Christmas gifts, this is the project for you! The recipient will surely love them! 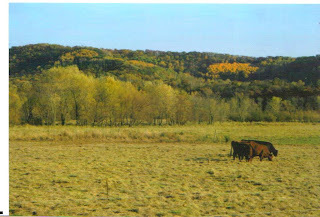 Here are the long-awaited pictures of my home, Buffalo County, that I promised you. These pictures were taken past peak because I just couldn't find the time to take pictures while the colors were in full peak. Either it was always raining when I had the time to take pics, or I didn't have an available car that day. But I still think the more muted fall colors are pretty too. 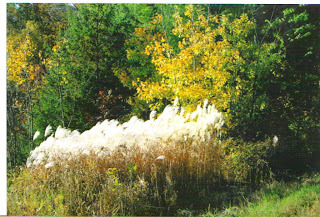 Its not the best photography because I took the pics at the wrong time of the day, and I also scanned these pics into my computer instead of directly downloading them from the camera, so the clarity is gone, but you get the idea, nevertheless. 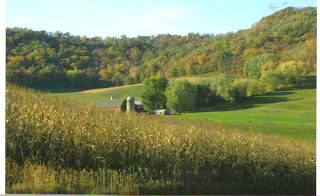 Buffalo County is primarily a farming community. We are not farmers, and don't live on a farm. We live in an old house built in the late 1800's. I've already posted pics of the outside of our home, and because so many of my readers requested pics of the interior of the home, I plan on showing pictures of the interior of the house decorated for Christmas soon; so keep checking back! 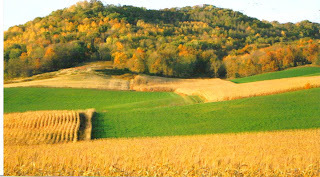 The area is known for two things: its scenic rolling hills and bluffs, and its trophy winning BUCKS! Hunters from all over Wisconsin and even the United States, love to come here to hunt because are bucks consistently rank as the largest in the State. 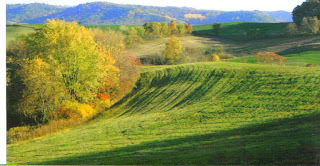 As a result, our land values have sky rocketed, because hunters want to buy land so they can hunt here. Every picture you see was taken within a 5 minute drive of my home. I just hopped in my car and drove 5 minutes in each direction and found such amazing beauty. 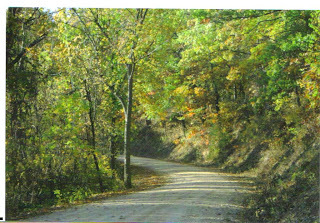 This is one of my favorite roads that I love to photograph and also to take walks on. Its so peaceful and beautiful. I found this beautiful ornamental grass growing wild. I would have loved to cut some of the blooms and bring them home, but I didn't have any clippers with me and wasn't sure if the DNR would appreciate it. LOL! Cows are something we see a lot of around here. You can't walk or drive more than a half a mile without seeing a cow! As most of you know, Wisconsin is the dairy state, although California keeps trying to steal our title away from us! 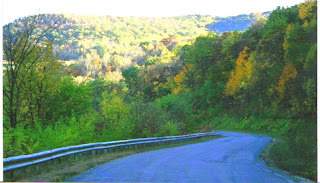 This final picture is one of my favorite scenes that takes my breath away everytime I drive on this road. One can help but believe in a Divine Creator when they see such beauty. 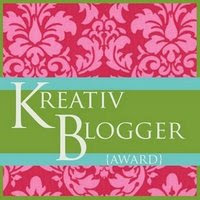 I received my VERY FIRST Blogger Award from my online friend Darlene. Her blog is Dar's Crafty Creations and you can find it by clicking on the title under my blog roll in the sidebar. Darlene is a wonderful stamper and probably the only person I ever met that stamps more than I do! LOL! So when you have a chance, drop by her blog and say Hi! I'll have to post my 5 nominees another day. I'm very busy making paper craft products for a local gift shop that wants to sell my 'creations' on consignment. I also have company coming for the Thanksgiving Holidays and I have so much preparation for that also. But I am looking so forward to having my home filled with people for the holidays, I don't mind the work. Most holidays we spend alone because our extended family is either scattered all over the United States or deceased. So this will be a very nice change indeed. I was at my local scrapbooking store on Thursday and I saw this adorable stamp set, and, well you know, I JUST HAD TO HAVE IT! LOL! The set is from Clear Dollar Stamps and is called 'Just Nutty'. It comes with the cutest images and sentiments. Some of the sentiments are 'Going nuts? ', 'From a bunch of nuts', 'Hang in there', 'its been nuts', 'I'm just nutty about you', etc. It also comes with tree/branch images, nut/leaf images, several squirrel images, AND rabbit ears if you want to change your squirrel into a bunny rabbit, and a Santa Claus hat for Christmas Cards. Its one of the most versatile sets I've ever seen. For this card, I used the tree, squirrel images, and nut images. My cardstock colors are Stampin Up! 'Old Olive', 'Chocolate Chip, 'Really Rust', 'More Mustard',"Not Quite Navy' and 'Naturals Ivory'. The Chocolate Chip panel was run thru the Cuttlebug with the 'Branches' embossing folder. I stamped the 'Naturals Ivory' background with the peanut image in the set, then sponged the edges with Chocolate Chip ink. The Leaves are cut with a Cuttlebug leaf die. The sentiment is popped up on dimensionals and hemp was added for embellishment. I colored the images with Copic markers. The Layout is this months 'Sheetloads of Cards' sketch. I also stamped the inside of the card, as shown in the second picture. Today I had my Christmas Card class. We had so much fun! It was such a good day. We made 25 Christmas Cards! The first guest arrived at 9:00 a.m., and the last guest left after 5:00, so it was quite a long day for some of the ladies. I think next year we'll just make 20 cards. LOL! I was very impressed with how fast the ladies picked everything up and how beautiful all their cards turned out. I had planned to take pictures of the event and post them for you all to see, but I ended up being so busy helping people all day, I never had the time to grab my camera and take the pics! Oh well, maybe my next class I'll have more time. I made this for both the Sketch Challenge and the Color Challenge on the new website 'Paper Craft Planet'. Have you visited there yet? Its amazing! I love it. Its sort of set up like Facebook, where you have your own page that you can design, 'friends', comment wall, photos, etc. I absolutely love it. I will always be loyal to Splitcoaststampers, but I can see myself enjoying Paper Craft Planet a little bit more. Simply click on the title of the website on the bottom of my sidebar if you'd like to visit the site. Anyhow, I made this card using the colors in the challenge: Stampin Up! 'Very Vanilla', 'Kiwi Kiss', and 'Baja Breeze'. I thought the colors were very 'beachy' looking, so I used the retired Stampin Up! set 'Balmy Breezes' for the main image. I stamped it in 'Close to Cocoa' and then colored it with prismacolored pencils. The sentiment is from Stampin Up! 'Upsy Daisy', and is also stamped in 'Close to Cocoa' ink. The shells are from 'Natural Wonders' and are stamped in 'Kiwi Kiss' and 'Baja Breeze' ink. Both the shells and sentiment are mounted up on dimensionals. The 'Kiwi Kiss' panel was made using the Cuttlebug Embossing Folder 'Script'. The ribbon is 'Very Vanilla' also from Stampin Up! I chose a birthday sentiment for this card, because I know thats where I'd love to be celebrating my birthday! What a way to celebrate! Unfortunately, I won't be able to be somewhere tropical for my birthday this year, but I do have tickets to see the musical 'Wicked' in Minneapolis. I am so excited! I have wanted to see this musical forever!!!!! I'm turning 46 on the 28th of this month, wish me a happy birthday, or better yet, send me a card of one your creations, I'd love it! I need all the encouragement and happy thoughts I can get, especially as I get closer and closer to the big 50! I'll post your card on my blog for all to see and admire. You can email me for the address or get it off the RAK list on Splitcoaststampers. I bought this stamp because the image reminded me of my own dear husband. He is always busy working on something around the house. But my hubby is a lot cuter than this guy! LOL! The cardstock colors are Stampin Up! 'Pacific Point', 'Basic Grey', and 'Certainly Celery'. The image is 'Tool Man' by Art Impressions. I made this card for a Featured Stamper challenge on Splitcoaststampers.com. The original artist is Becca Stamps and her card can be seen here: http://www.splitcoaststampers.com/gallery/photo/995539?cat=500+ppuser. To participate in a Featured Stamper Challenge, you must change at least two things. I changed the sentiment, the layout, and the ribbon. The scalloped squares were cut using Nestabilities. The sentiment is from the retired Stampin Up! set 'All I Have Seen', and is mounted up on dimensionals. Its stamped in Stampin Up! 'Sage Shadow' ink. The photo corner is from Sizzix. The cardstock is 'Sage Shadow' and Georgia Pacific White. I used the Cuttlebug Embossing Folder 'Leafy Branch' for my main image and colored it with chalk. I added ribbon, a hat pin/beads, and adhesive pearls for embellishment. I made this page for a sketch challenge on the blog 'Totally Random', of which I am a creative team member. I used the same pictures of my garden that I already posted for you all. Three sheets of designer paper were used for the background: 'Basic Grey', 'Provo Craft', and 'Kimberly Poloson'. I used my sewing machine to stitch the larger 5 x 7 designer paper panel to the page. The leaves are the 'Cut and Emboss Maple Leaf' from Cuttlebug. For my title I used two different stamp sets and a Cuttlebug Alphabet. I used a 'Autumn Leaves' Spectrum Ink Pad for the word 'Fall'. The bottom panel has a sentiment stamp from Hero Arts that has a bunch of fall words on it like: "fall-turning leaves and the harvest moon-cool mornings and warm afternoons-back to school-pumpkin pie" etc. I used my Cropadile to set eyelets in the panel and then ran a fall colored ribbon thru. I made this card for this week's Featured Stamper Challenge on Splitcoaststampers.com. The featured stamper is Wendybell. You can see her original card here: http://splitcoaststampers.com/gallery/photo/1117408?cat=500+ppuser The rules of the featured stamper challenge is that you must change at least two things, well, I changed the shape of the card from a square to a standard card (because I don't like to pay extra postage for a square card! LOL! ), the sentiment, ribbon, and I eliminated cutting out and mounting up some of the leaves because I was too lazy to do all that extra work! LOL! This stamp set is still available to purchase in the Holiday Mini Catalog. Click on the picture of the mini catalog in the right side bar if you'd like to view the set. It comes with other elements (flowers, snowflakes, and a bird) to put on the tree, so it can be used for any season of the year. Its a fantastic stamp set and one of my personal favorites. For my readers that may not already know this, on Splitcoaststampers.com many people request R.A.K. cards, (Random Acts of Kindness) for people they know and love who need some kind words from strangers. This is a R.A.K. card I made for a man diagnosed with Stage IV Cancer, and unfortunately his father was also diagnosed with cancer at the same time. Its always hard to know what type of card to make and what to say, especially if you don't know the person's faith or personal taste, so I chose a masculine image and colors. I feel the image expresses my sorrow at hearing such news, and I think the sentiment is appropriate considering the circumstances. To make my card, I used designer paper from 'The Pets Stack' at Michaels. The cardstock colors are all Stampin Up! 'Close to Cocoa', 'Chocolate Chip', 'Creamy Caramel', and 'Naturals Ivory'. The image is Stampin Up! 'For Father'. I used a cuttlebug embossing folder for the zig-zag stitch, and a button and ribbon for embellishment. Last week's Scripture Challenge Word on Patter Cross's Blog "Triple the Scraps' was "Need". To do this challenge, I picked my favorite Bible Verse using this word: "And my God will meet all your needs according to His glorious riches in Christ Jesus". Phillipians 4:19. The verse always spoke to me because it helped me to not worry about material things, but also encouraged me in ministry as well. Whenever I felt inadequate about accomplishing a goal, I recited this verse in my head. It helped me to reaffirm that God will provide everything I needed to carry out His work. I used Splitcoaststampers Color Challenge and Sketch Challenge to make this card. The colors last week were 'Pretty in Pink', 'Kiwi Kiss', and 'Riding Hood Red'. I embossed the pink and white background with my cuttlebug and the embossing folders 'Swiss Dots' and 'Floral Screen'. The main image is retired Stampin Up! 'Seasonal Sprays' and is colored with Stampin Up! Markers. The sentiment is computer generated and is mounted up on dimensionals. I added a small ribbon for embellishment. Sheetloads Blog Candy Blow Out! 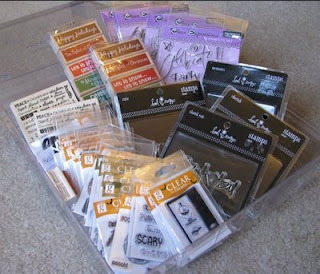 The Blog 'Sheetloads of Cards' http://sheetload.blogspot.com is having a fabulous blog candy this month. Four lucky winners will split this booty! Check out: http://sheetload.blogspot.com/2008/11/November-blog-candy-blow-out.html for more details and how to play along! I made this card for last weeks sketch challenge on Splitcoaststampers. I have been so busy getting ready for my craft show, my Christmas Card Class on November 15th, and decorating the house for Christmas (Yes, I start this early, I decorate EVERY room in my house and it takes me about 3 weeks to finish! I'll post pictures when I'm done) that I haven't been able to participate in any challenges. I did however need birthday cards, and I loved this sketch, so I took the time to make this cutie. I used Stampin Up! cardstock 'Bashful Blue', 'Rose Red', and 'Certainly Celery'. The images are the retired Stampin Up! 'Favorite Teddy Bear' and the current Stampin Up! 'Pun Fun'. The blue panel was embossed using my cuttlebug and cuttlebug embossing folder 'Swiss Dots'. One of the balloons is mounted up on dimensionals. The images were colored with copic markers. The ribbon is from Michaels. If you'd like to order the Stamp Set 'Pun Fun', just email me or go directly to my website. You can also view this set in the current Stampin Up! catalog pictured in the sidebar of this post. Just click to view. Last weeks Scripture Challenge word on Patter Cross's Blog 'Triple the Scraps' was 'Encourage'. We were challenged to make a card using the word 'Encourage' as our inspiration. One of the Bible verses that Patter shared was 1 Thessalonians 5:11 "...encourage one another and build each up....' I love that verse! So often we as believers can be too critical and end up tearing each other down, instead of building each other up! But God calls us to encourage each other in our faith, our gifts, and just living a Godly life. For my card, I chose bold bright colors from Stampin Up! : Tempting Turquoise, Green Galore, and Real Red. I embossed the red cardstock using my cuttlebug and a cuttlebug folder. The Stars were also cut using my cuttlebug. The sentiment is mounted up on dimensionals. The image is from My Sentiments Exactly 'U set'. This weeks Scripture Challenge Word is 'Need'. Hope to see you playing along! On Saturday, November 15th, I will be having a Christmas Card Making Party at my house. We will be making 5 cards each of these 5 designs. The cost is $20.00, thats only 80 cents per card! You can't ask for a better deal than that. The class starts at 9:00 a.m. and lasts till ?????. As you can imagine, it takes a long time to make this many cards. Some people stayed till 1:00 or 2:00 p.m. and finished them all in class, and other people had to leave early and finished them on their own at home. The choice is yours. I will have plenty of delicous food and coffee to keep us energized, and hopefully my home will be decorated for Christmas by then so we'll be in the 'Christmas Spirit'. If you'd like to attend, please let me know by November 10th so I can have all the materials cut and prepared for you. I have had some ladies ask if they could bring their teen daughters along to help make the cards since there are so many, and yes, of course you may bring your daughter (or son, I don't want to be sexist here. LOL!) along. Just let me know if you want 25 cards or 50 cards.